This was another long day on the road, from Santa Monica, by the Pacific Ocean to Las Vegas in the Nevada desert. After a light breakfast I drove the first stint through Los Angeles and onto the i15. Leaving Los Angeles on Sunday morning worked well, the traffic on the freeway was flowing nicely and we reached our lunch stop near Barstow in about two and a half hours. Barstow seemed like one of these forgotten desert towns, but I’d heard that Peggy Sue’s 50’s Diner was the best place to stop and it certainly lived up to its reputation. The food was good and it has also turned itself into a tourist attraction in its own right with a diner-saur park and gift shop. After lunch Jen took over driving duties and got us across the state line to Nevada, where I resumed driving and took us on a detour to see Lake Mead and the Hoover Dam – which meant we also crossed into Arizona, so 3 states in one day! Driving back from the dam towards Las Vegas we got more and more excited as each of the landmarks became visible on the horizon, but it was only when we turned onto the strip that we got the full effect and realised just how crazy this city is. 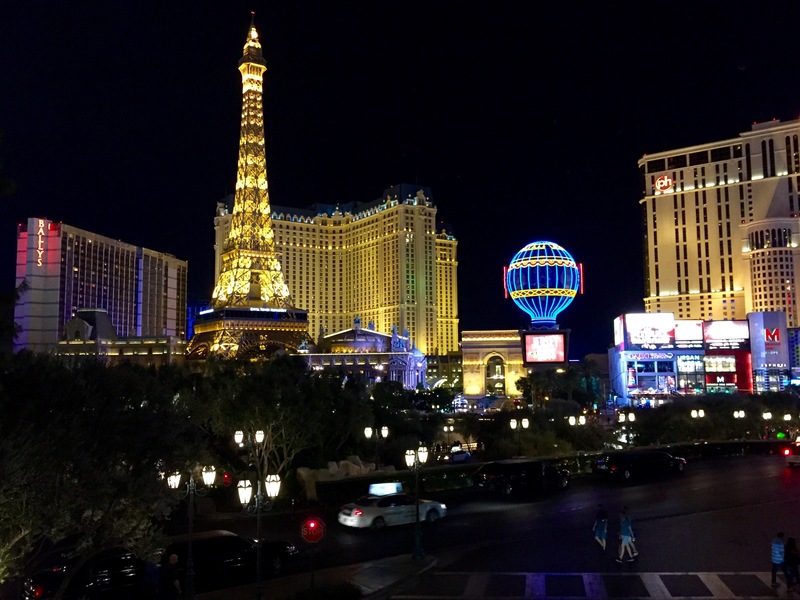 We checked into our hotel – Paris – and decided to upgrade to a suite, it was expensive but the views over the Eiffel Tower and Bellagio fountains were worth it. I’m slightly concerned that Jen is getting a taste for hotel suites though! One thing we learned early on is that you need to make a reservation for the popular dinner spots. We ended up doing an impromptu tour of the strip looking for somewhere to have dinner, eventually ending up at Gallagher’s in the New York New York casino. It was worth the walk – we both had huge steaks which were delicious.